For the past four years I have had the privilege of speaking at Warrior Fest, an annual conference hosted by my friend Perry Stone. Every spring and summer, he and his team at Omega Center International host events called “Warrior Fests” which several thousand teens attend to experience a touch from God. I am always amazed at the atmosphere that is fostered in each service; it is what I call a “safe space” where the hurting and broken can find hope and reassurance in Christ. Over 3000 young people packed the facility for three days of worship and ministry. Many were first-time attendees who came at the behest of parents and pastors. That being the case, they brought with them all of their “issues,” which is exactly what I preached about. The woman with the issue of blood in Mark 5 was a perfect example. I entitled the message “Cancel My Subscription to Your Issues.” As expected, the Word of God did what only it can do, piercing the hearts of those who had been enslaved by past and present unresolved issues in their lives. Just as the woman in the story, these broken ones came forward desperate for a touch from heaven, believing that their faith would change everything. The time of personal ministry at the altar lasted for almost 2 hours. I am always surprised with how many young people at the altar are dealing with deep-seated issues of rejection, addiction and depression. During this time of ministry, the teens would grab me wanting only to be hugged. Through tears they expressed the great pain they had experienced from broken families, abuse and addiction. The emotion that washed over me, hearing their stories and listening to their pain impacted me like never before. Each prayer offered and each hug given was infused with a supernatural impartation that overwhelmed and at times brought them to their knees. Jesus was indeed present and He was doing good to every person who responded to Him in faith. I will begin my international travel schedule in August. Brazil has become a incredible harvest eld for our outreaches. By the end of the year I will have held over 70 meetings all over this nation. This face-to-face time with a generation has not only encouraged me but has proven to me that God’s mercy continues to be poured out on all who would call on His name. Thanks for helping reach a generation for Jesus! I just returned from India, It was my first time back since 2015 and it was good to connect with old friends. My friend Josh hosts an annual event called “Alive.” This event is specifically targeted at teens and young professionals. It is an evangelistic outreach designed to challenge this new generation in India to put aside the rules and regulations of the past, and step into a new life of faith in Christ. In most of the countries I minister in, a translator is needed and this trip was no different. I did not invite him on stage, however, until the very last minute, utilizing him only when I began to read direct quotes from the Bible. It was a nice break to jump from English to Telegu at my leisure. Over 500 people were in attendance, many having traveled from great distances to be a part of this life-giving event. I was amazed when I saw the largely young believers and unchurched crowd respond to the Spirit of God. The faith stirred in them through the worship and Word allowed walls of fear and tradition to fall away, exposing hungry hearts to engage with a God who most of them had no intimate relationship with. My heart was overjoyed to see God’s grace again reaching out to the next generation! My heart was overjoyed to see God’s grace again reaching out to the next generation! When I had the opportunity to speak at a conference in Visak in 2005, it was a large outdoor event on the local beach. It was billed as a music conference with a local band called “Sound of The Nations.” That was 13 years ago and the impact of that event is still remembered around the city. I had a twenty-one year old young man and his father approach me after our first service last week. The young man told me how honored he was to be able to speak with me. He was seven years old in 2005 and he and his father had attended the conference that weekend. He recalled how God ignited something in him that was still burning in him thirteen years later. His father was volunteer at that time and is now pastoring a church in the community. It is moments like this that remind me that all I do is not about me, it is about HIM! He has given us the privilege of sharing His powerful Word with others! Thanks again for helping me go into all the world! I just returned from Brazil, what an amazing time we had promoting Jesus as Lord! We were again ministering in the state Bahia, the place I now affectionately call my second home. I arrived in São Paulo, 15 hours in the air, and as soon as I landed, we got in our truck and drove another nine hours to be a part of an annual conference. Porto Seguro is a city located in the far south of Bahia, Brazil. The city holds a distinctive place in Brazilian history: in 1500 it was the first landing point of Portuguese navigators. I refer to it as the “womb” of Brazil. It is here, in this strategic city, that my friend Rene Terra Nova holds an annual prophetic conference, rallying believers for 4 days of ministry and prophetic declarations over the nation. I was surprised when he asked me to speak the second night of the conference. His charge to me was “Chad, speak about protecting and empowering a generation.” Although my time was limited, God showed up in typical fashion, pouring out His spirit and grace in the service. It was a huge opportunity for me and for the vision God has placed in my heart for Brazil. Countless doors have opened for me in an unprecedented manner throughout numerous denominations and nationwide church structures. It was an honor to declare words of life over thousands of key leaders assembled at this conference. After the conference we drove 8 hours back to the city of Feira de Santa Anna, our base of operation in Brazil. My long time friend and translator, Pastor David Suassuna, had a 9:30 am service and he was desperate to get back for the early service. David is the lead pastor of Peniel Baptist Church, I was thrilled to speak to his congregation. Yes, we were exhausted, but God moved mightily in the service. It was a joy to be with him and his church family. Having worked in Fera for the past eight years has given me the opportunity to make numerous friendships and form genuine relationships with many key leaders. When they found out I was going to be in town for a few days they filled my schedule. Two of these events were very memorable. One was a church camp in the middle of nowhere. The crowd was of different ages, something I’m not used to doing, since most of our efforts are focused on teens and young adults. Despite the demographic challenges, God displayed His amazing grace with the altars being filled with young and old alike, with 5 teens accepting Jesus for the first time. The pastor was thrilled considering that these were kids who had been raised in church yet had never been born again. It confirmed again to me that God is just looking for someone who will lift Him up so He can unveil His love and mercy to those whose hearts have been hardened for many years. He can unveil His love and mercy to those whose hearts have been hardened for many years. Our last event was an outdoor evangelistic outreach in the city center. I brought the animals for this event and they were a show stopper. A few hundred people gathered to not only see the giant python, but to listen to the message of hope that was presented. God did not disappoint and the Spirit of God fell in a dramatic fashion, touching all who were in attendance. Lives were touched, hearts melted like wax and many prayed to receive Jesus for the very first time. Thanks again for helping me go into all the world. Looking back over this past year, my heart is incredibly thankful for all that God has allowed me todo. The grace and mercy that was extended is humbling. Brazil was our focus this year resulting in unexpected doors and opportunities for 2018. I was asked if my time flying on planes, riding in cars and sitting in airports was really worth it? My response is always a resounding YES! Seeing God pour out His Spirit on thousands of young people and knowing His grace and mercy has ushered thousands into His Kingdom is a joy that cannot be expressed in words. None of this would have been possible if were not for your faithful support of our outreaches. 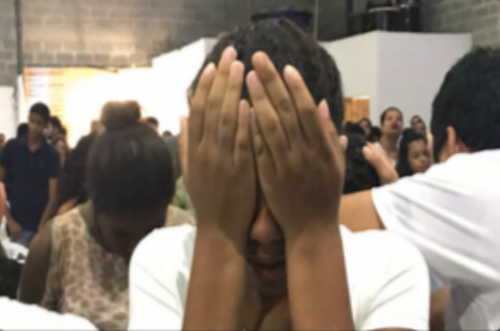 "Jesus is that great light and it is my daily prayer that those who still walk in darkness will encounter our God"
Last month I completed my seventh trip to Brazil for 2017. Although my heart is always focused on the nations, it is good to be home for the holidays! Thanksgiving was a memorable time together. My son, Max, was home from college, my sister drove in from Los Angeles and Rhett, my youngest, turned 17. This week we completed our 7th box of Youthbytes! Filmed in Israel, India and Hong Kong, this collection gives us thirty-five, 30-minute television shows and seventy individual teaching sessions. I’m constantly amazed at all that God has done with the little bit of creativity we have made available to Him! Jesus is that great light and it is my daily prayer that those who still walk in darkness will encounter our God, whose grace and mercy is more than able to bring them out of darkness into the glorious light of His salvation! This is also my prayer for you and your family during this season. That the light of Gods Word will continue to illuminate your path and direct your footsteps as you enter a new year. Thanks again for standing with us as we go into the world with the Good News of Jesus. I just returned from Brazil, my seventh and final trip of the year. All I can say is wow! God’s amazing grace and passionate love for a generation continually challenges and convicts me. This was our first time to the state of Amazonas and it did not disappoint. Each service was with a new contact and church. Although we did not have our animal examples, the simplicity and power of God’s Word did what it always does, captivating and convicting the hearts of all in attendance. There are no words to describe the anointing and power that was poured out in each service. Salvation, deliverance and healing were available to anyone who reached out to Jesus in faith. "There are no words to describe the anointing and power that was poured out in each service." This was a long but fruitful trip. Jesus ministered to our team and those in attendance in a way that I have not experienced before. It was His tangible presence that not only charged the atmosphere, but provoked deep change in all of us. His Word has that unique ability, to reveal all of who we are, strengths and weaknesses, exposing our need for more of Him in every area of our lives. Our calendar for 2018 is filling up quickly, Brazil is calling and we are answering, believing that we will be able to reach even more hurting teens than we did this year. Thanks for your continued support. We could not do any of this without you! Have a great Thanksgiving with your family. We have so much to be thankful for in Christ! I just returned from Brazil, what an amazing time we had promoting Jesus as Lord! We were ministering in the states of states, Alagois, Pernambuco and Bahia. These were all new churches and as usual they requested that I bring “Galak” to the meetings. From the very first meeting it was obvious that God was ready to touch the lives of all in attendance. In one of services the altar call and ministry time lasted for almost two hours, God displaying His power in a dramatic fashion. Since the beginning of this ministry, my main focus has been teens and young adults, and after doing this for almost 30 years, I can honestly say there is no place I would rather be than here, in the center of His will. God did some amazing things on this trip. People were healed, delivered and set free in many areas of their lives. But there was one incident that stands out above all others. During the altar call at one of our rest services, a mother came forward with her eight year old son. As they stood there quietly I was led to go ask her what she needed. I was stunned as she explained through deep sobs that her son needed help. He was suicidal and had tried to take his life six months ago. I was blown away. Through my interpreter I spoke to the young boy explaining the love of God and that Jesus had the power of life and death. He listened intently, smiling back at me and with tears welling up in his eyes, he quietly said he wanted to be free. I knelt down and had the privilege of leading him in the sinners prayer and then rebuked the spirit of death in Jesus Name. We recently completed four more TV shows filmed in India, Israel and Hong Kong. I'm excited to get them to closed captioned and translated into Portuguese. I will be leaving in October for another trip to Brazil. We will be ministering in the City of Manaus, the capital of the vast state of Amazonas. God has again opened another state to us and another group of incredible contacts. Please keep this upcoming trip in prayer. God’s grace has continued to remain on us during this season, encouraging us to continue our outreaches in Brazil. As always, I will walk through any door God sees fit to open for me. In each service God’s Spirit visited us with an incredible manifestation of His power and mercy. When the power goes out in the city during an event, just grab your phone and light up your object lesson. Having lived in unforgiveness for many years, Jesus revealed to her a new way of living in Him! Merry Christmas and Happy New Year! I just returned fromanother incredible ministry trip to Brazil. This will complete2016 with a total of six trips to the South American Continentand each trip was better than the previous. We focusedour attention on the State of Rio in the municipality of VoltaRedonda. We had 16 meetings in 14 days including hIghschools, colleges and church meetings. Even though the logisticswere challenging, the meetings were a huge success.My ministry team, who is based in the State of Bahia, whichis 22 hours north, had to drive the precarious 1500 km journeywith product and our animal examples in less than 24hours. Regardless of bad roads and unexpected stops, theyarrived just in time to have our first meeting. As with all ofour meetings, Gods presence and power were manifest inevery event. Hundreds responded to the call for salvationand God met the needs of all who were in attendance. I amalways amazed at the way God does things. When we arefaithful to stand and preach His word, He faithfully ministersto young and old in each event, confirming His love for eachperson, encouraging and empowering them by His Spirit. There is nothing greater than seeing the lost come forward toreceive Jesus as their personal savior! Morning radio programs in Rio were always a blast. The animals were well behaved with my friend AndreCâmara at Boa Novas TV in Rio. They will begin airingour program in February 2017.
had another great opportunity to speak withJoyce Meyer about teen age suicide. As we would minister to people in the altar, God would speakprophetic words of life and hope to the hurting! I just returned from a fruitful trip to Hong Kong and India. I have not been back for almost two years and I was excited that we had the opportunity to return. We made the most of our stop over in Hong Kong and filmed 5 programs. We visited the Gold Fish Market, the Wishing Tree and the infamous Temple Street Market. Each location offered the perfect backdrop to communicate a powerful message. As with all the videos we create, we use a natural example to explain a spiritual truth. I cant wait to get these edited and on our App. After our brief time in Hong Kong we traveled to India to be a part of the Alive Conference in the city of Hyderabad. My friend Josh Komonapali hosted this event and I was honored to be a part of it. As usual we communicated the message of Life utilizing the Sea of Trees video and the results were the same as so many times before.Young people came forward weeping, crying out to God for freedom and peace as they struggle with this life. Jesus was faithful to not only impart grace, but also set them free from many strongholds that kept them bound. After the conference we boarded an overnight train to head to the city of Amalapuram. There is no greater experience than traveling in India by train. The smells, the sounds, the animals and frantic pace of the stations reminds one of how good we have it in the USA. Arriving at 5am the next morning we took another 2 hour van ride to the city. Working with Josh and his families established ministries, we had three full days of production, meetings and lots of fellowship. Our first stop was to a high school where we shared about harnessing the power of Gods creativity in our personal lives. The teens were intrigued by our stories and method of communicating the truths of God’s Word. The highlight of the trip was going to visit the Leper and HIV home. I have always had a very soft spot for those whom society has rejected. Even though our time was limited, I was excited to shake their hands, look them in the eyes and pray over each of them. They get very few visitors and our time with them was appreciated. We of course could not go to India and not film a memorable video message. We had the opportunity to visit a free cataract surgery clinic and film in the operating theatre. Clothed in surgery scrubs I communicated how cataracts in the natural can limit our ability to utilize natural light, so does unforgivness and hardness of heart limit our ability to walk in Gods light. It was a profound simple message. From here we visited a home for children to share the Gospel with them. What a blast it was to have 250 attentive souls hanging on every word. I of course could not do a normal message, I needed to take it to another level and I did this by utilizing a T-Rex blow up costume. The message “Calling on Jesus Name when your afraid” was gladly accepted by the kids. Well, there were a few shreiks when he made his appearance. Each night we had the opportunity to share the Word of God in small outdoor street meetings. This can be tricky since India frowns upon “conversion meetings” especially when foreigners are involved. This fact however did not deter us or our team from giving it 100% each night. As we shared the Word I was reminded that the secret to the Gospel is not in my power to communicate, but in its ability to produce faith when it is read. As expected each of these meetings did exactly that. Men, women and children responded to the simple message of Jesus, some for the very first time, others received miracles of healing as they came forward for prayer. There is no greater experience than praying for someone who is desperate, someone who has no hope outside of Jesus. We prayed for all in attendance and were amazed at what God did through our simple obedience. It was an fruitful trip on all fronts and I am confident that the seeds sown during this time will produce fruit for eternity. We have plans to return to this wonderful nation in 2017 to again participate in the Alive Conference. Thanks again for helping us go into all the world for Him! Fall has finally arrived in Southern California and this canonly mean one thing; temperatures are heating up inSouth America. I just returned from a two week, 2000 mile road trip back to the states of Bahia and Sergipe.We had such powerful meetings here last month thatwe wanted to return and finish what God started. In every service the power of God was made manifest as hundreds of young and old responded to the tangible presence of the Spirit of God. As with all of our events there is an emphasis on salvation and encountering Jesusin a very real personal way. I am always amazed when I see HIM open the eyes of the desperate and bring life to those who are on the verge of giving up hope. At times the Spirit of God would be so strongly felt that we could not finish the service as people began to cry and weep around the venue. I attribute this directly to the prayers that you and others have offered to heaven on behalf of a generation. In every service the Spirit of God would manifest with such power that young and old would shake as He met their needs! The altars were always filled with hurting young people who were desperate for a touch from Jesus..He never dissapointed! The times of personal ministry at the altar was incredible. I had a number of last minute opportunities arise while we were in the city of Aracaju. Numerous newspaper, radio and TV interviews were gladly accepted. But what had to be one of highlights was being invited to speak at a public high school. As usual we brought the snake and explained how small things get big, especially if you feed them. As I finished the meeting and began to speak very personally to the kids, the atmosphere changed and you could feel that heaven had just stepped into the court yard. The teens began to grow very quiet and then began to weep out loud. I was amazed that the grace of God had been made so very obvious to these hungry souls. I turned to look at the administrators and teachers and they were weeping as well. The principal gave me two thumbs up to continue with the message, taking as much time as I needed. I quickly pointed the message to the work of the cross and how Jesus had come to save and set free. Hundreds raised their hands, some accepting Jesus for the first time, others rededicating their lives to Him on the spot. Ths simple message of the Cross and the promise of the life it offersopened the hearts of the people and the doors of heaven, creating anatmosphere of freedom and joy! I was excited to see the response of the people to the Word of God and to His powerful presence. One of the hosting pastors was commenting, “we thought you were just a white guy with a snake who told stories.” I laughed out loud when mentioned this, telling him, “well sort of, I do use a snake, but the only story I tell is the one about a God who sent His only Son to die for the world,” he smiled and agreed that this story was all we needed. Although it was a fantastic trip, there were many challenges along the way. I had to utilize two new translators, who were nervous to say the least, a sick Iguana (who eventually died) and a head cold that never got any better. In spite of this and a few other communication issues, it was one of the most powerful trips I have ever been a part of, at least in Brazil. I will be returning in December to Rio for another two weeks of meetings. Please keep this and my current trip to India in Prayer. God is doing some wonderful things and I am believing that I will have the grace and strength to continue being obedient to Him in all areas of my life. Thanks again for helping us reach a generation with the Gospel of Life! God was working not only in the hearts of the teens, but in their parents as well. Summer is ending and as usual Brazil is calling. I just returned from a two week, 3000-mile road trip through three states in the Northeast of the nation, Bahia, Sergipe and Pernambuco. Me, my interpreter David, our worship leader Caprini and our staff Vet Dean crammed our animal menagerie into our truck and completed 20 meetings in 15 days without any loss of life or limb! We worked hard to get to every event on time and God honored our faith and willingness to go where few people want to go. In every service the grace of God was made manifest as hundreds of young and old responded to the message of freedom and life in Christ! The reports are continuing to come in from pastors telling us that the freedom and deliverance received during our “Life Events” is continuing to produce fruit. Our message is simple; “Jesus wants to do good to you, regardless of how far you may fnd yourself away from Him.” The snake, the iguana and owl are all memorable examples we use to communicate the life-giving message of Jesus to a generation. We finally acquired a ministry vehicle to travel the nation and transport our exotic payload with ease! I was excited to have my Biologist and Veterinarian friends come and help me communicate the truth of God’s Word through His “wild” creation! As young and old responded in faith, Jesus met them at their place of need and imparted life and hope! God opened an awesome door for us during these meetings. Correction officials in the state of Sergipe asked us to visit a maximum-security prison for violent teen offenders. Murderers, rapists and thieves, some as young as 12, crowded in cells of 15 or more, listened attentively as we shared the forgiveness found in Jesus! I could go one for hours about what God did on this trip, hundreds saved and set free as we shared the Gospel with boldness. Thanks for helping us go! I just returned from a quick but fruitful trip back to Brazil. I had a business meeting with a couple of TV stations and a creative sit-down with my friend Pastor Marco who is my “TV voice” in Brazil. As with any other trip, I always try to make the most of my time, and in this case it was also to promote the “Life Event” strategy with a few key churches. We recently translated the Sea of Trees into Portuguese and we have begun to hold these anti-suicide events around the nation. My friend and translator coordinated some of these meetings in Rio and they were more than we expected. The first event was in a Baptist Church which graciously opened their doors to their weekly college and career service. I was curious to see how the message would be received and the altar call confirmed what I suspected. Over 100 young adults came forward for prayer, asking God to not only deliver them from tormenting thoughts and overwhelming hopelessness, but also to receive grace to forgive those who had hurt them. As the Spirit of God began to move, voices were heard all over the sanctuary crying and weeping before the Lord. I was encouraged as the altar service continued for almost 45 minutes. God did so many wonderful things that night, I am still receiving reports about the services. We recently released the Sea of Trees DVD in Portuguese and the results we have seen utilizing this unique message have been overwhelming. At each service the Spirit of God moved on the hearts of all who were crying out in faith to Him. The time praying for young and old at the altars was incredible. I was honored to agree with those who were believing God do a miracle in their lives. The other event we held was with a friend of mine at an Assemblies of God Church in Rio. The pastor hosted us years ago when he was a youth pastor. The night was one of the most unusual I have had the privilege of being a part of. It was Sunday night and the crowds were smaller than usual. I had to have the teens come forward from the balcony to be in the front with me. After I preached and showed a clip from the video, the spirit of God began to move, but this time it was a very definitive direction that I was experiencing. I noticed a woman in the audience and called her forward with a word of Knowledge. As she walked forward to the left side of the stage I could tell something was happening in her life. She approached the stage defiantly. As the word for her came forth, she began to break and weep openly. As we ministered to her the church was getting very excited, which I thought was odd since we did not use the microphone to speak with her so they heard nothing I said at the altar.. When I finished, I was directed to the far right side of the stage and called a teenager out from the crowd. She came forward weeping and to my surprise, I gave her the exact same word from the Lord that I had minutes before given the other woman. Suddenly as the young girl began to weep and cry with great force, a voice whispered in my ear, “Chad, this is that woman’s daughter.” I was blown away. I quickly went down, grabbed the girl by the arm and brought her to her mother who was now lost in a flood of emotions and great joy. As I presented the daughter to her mother the church went wild. The two embraced and wept, rejoicing in what God had orchestrated. As I later learned, the woman had 4 different children from four different men and had a questionable reputation. She had been concerned that her daughter was following in her footsteps and did not know where to turn. God singled out this family that night to not only bring restoration and reconciliation, but to confirm to the church that it is He who hears the prayers of the broken and gives grace to all who call on HIM! I just returned from Brazil and November has own by very quickly. During the 1st weekend of the month I had the opportunity to again be with my friend Perry Stone for his annual Reformation Weekend held at the Omega Center International in Cleveland, Tennessee. Over 2500 young people were in attendance, expecting God to do something wonderful, and He did not disappoint. On my Friday night session, I was amazed to see the hunger and intensity in the crowd as worship progressed. God was again con rming that He was raising up a generation who were unashamed to worship Him, in public and in private. The altars were full every session and reports of God’s grace were heard all weekend! I had a number of young adults who approached me and wanted to say thanks for the Youthbtye program, that it that had encouraged them over the years and at times was their only source of discipleship. As these events concluded I made it home for 48 hours and then headed down to Brazil for another set of meetings. Continuing where we started in 2010, our events in local churches were well-attended and God touched hundreds in unique ways. Ministering again in the state of Bahia, my schedule was just as packed as every other trip. The requests from the church to see the snake was overwhelming, however “She” did not always grace the stage, instead she showed up only at the end of service for hundreds of sel e photos! From the very rst meeting, the Spirit of God made Himself known to all in attendance. I focused on the issues of unforgiveness and rejection and the response was nothing less than shocking. Hundreds of young and old made their way forward, not only seeking forgiveness but looking to forgive others who had hurt them. The intensity of these altar moments was at times intimidating, especially when we went to lay hands on people. Those in attendance were desperate and their faith was touching heaven, changing the environment in every meeting. In every event there is always something special that stands out. This was the case in Tennessee last month. A 21-year -old girl approached me at the altar declaring that she was addicted to prescription drugs and wanted to be free from this. I told her to raise her hands and when she did she crumbled to the ground with a shriek. As I began to pray in the name of Jesus, a male voice began to speak expressing in no uncertain terms that it was not going to leave her and and that her life belonged to him. Well for me that was like putting blood in an ocean full of sharks. I quickly began to rebuke the spirit and prayed with great intensity, at which time her body began to buck and writhe on the ground with great force. I was amazed a girl of such size could command such strength. With a gasp the demon went silent and she fell limp. I asked her mother to come agree with me in prayer over her daughter. When she touched her daughter she opened her eyes, confused as to what had just happened. I looked at her and said, “I am now going to pull you out of your old life and into the Life of God, this is an act of faith, do you believe?” Through the tears and confusion she said yes! As I pulled her up I could actually feel resistance, as if the spirit that held her was pulling her back to the oor. I began to pull even harder, shouting the name of Jesus and she leapt forward as if being pushed.She landed on her feet and her hands went straight up into the air and she began to praise God. Her mother was thrilled, explaining to me that this decision to come for prayer was her daughter’s and not hers. The next morning the girl approached me explaining how she had not remembered much from the night before other than that she was now free and had not felt this in way in many, many years! I was excited to see that Jesus had again set someone totally free! It has been a great month. The weather is changing and rain has been forecast for the next 6 months. After my return from Brazil I began gearing up for a busy month. In August I was asked to be a guest speaker at “Gracefest”, a local music festival featuring some of the best Christian musicians in the country. I was asked to give an altar call message at the end of the evening before the Newsboys took the stage. Thousands had been sitting in the sun all afternoon waiting to hear the headliners perform. My message was simple: the tomb of Christ is empty; what does that mean to you? As I read out of the book of Luke, chapter 24, you could feel a hush descend over the crowd and the teens and young adults engaged me immediately. With a short 20 minute window to share the Word and ask for a commitment to Jesus, I was very purposeful in my delivery. As I asked for a show of hands from those who had never given their lives to Jesus, hundreds of hands went up all over the venue. I then asked them to place their hand on their heart and pray with me. The enthusiasm was contagious and provoked me to then pray for those who were sick. The reports from this short ministry opportunity have been wonderful! I’m always honored to be able to share about God’s love in a public venue. It gives the church an incredible voice of hope! We had an opportunity to share our discipleship tools at a pastors’ gathering in Anaheim last week. The Association of Related Churches was more than generous giving us this advertising space. The message at Gracefest was one of restoration and reconciliation. It provoked young and old to consider who Jesus is to them personally. Hundreds raised their hand, acknowledging their need of a saviour who understands. I was in Baton Rouge for a few days and had the opportunity to speak at Christian Life Academy. I was honored to give back to a school that invested so much in me.